Homemade Christmas candy makes a wonderful family tradition. There are certain tastes and smells that immediately bring back nostalgic memories of love, home, and family. We have 100's of recipes here at Chocolate Candy Mall for you to choose from so that you can create the foundation of those precious memories for your own family. You're more than welcome to steal one from us to use this holiday season. But don't be a scrooge! If you've got an old favorite, add your own for others to enjoy. This first recipe is a good one to get you started before you head off and explore for more. I 'discovered' it at Family Corner. They always have plenty of great ideas for food and fun. 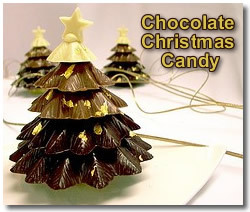 Apparently, this particular homemade Christmas candy is very popular in Vancouver, British Columbia, in Canada. 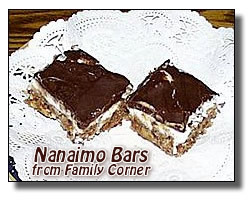 It's a beautiful part of the world, so they deserve to be home of a scrumptious chocolate dessert. 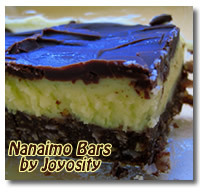 There are different versions of the Nanaimo Bars candy recipe. Sometimes it's made with vanilla pudding powder (or custard powder) added to the second layer for flavor. Other recipes call for graham cracker crumbs instead of rolled oats. You can make adjustments and substitutions until you discover your own personal favorite version. I don't like coconut, so I'd leave that out. 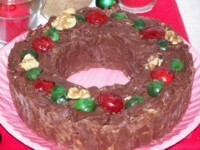 Maybe this homemade Christmas candy recipe will become a new family tradition at your house! Lightly butter a 9 inch square baking pan and set aside. Melt 1/2 cup butter and 4 ounces of the chocolate in a heavy saucepan over low heat. Remove pan from the heat and add the white sugar, egg, oats, nuts, coconut and 1 teaspoon of the vanilla, stirring it well. Press the mixture into the buttered pan and chill for about 1 hour. In a mixing bowl, combine the powdered sugar, the 3 Tablespoons of softened butter, vanilla, and milk. Beat well until smooth. Spread the icing over the base and chill another 30 minutes. Melt the chocolate and the remaining 1 Tablespoon of butter over low heat, stirring until smooth. Spread the final layer on top and chill for at least 4 more hours. Variation: You can play around with different combinations like adding some green food coloring to the icing and using mint flavored chocolate chips, etc. 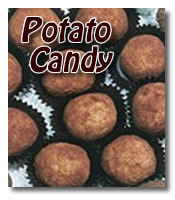 Have you ever heard of potato candy? No? Well, as surprising as it sounds, it's worth trying. It's not difficult to make and you may fall in love with it. 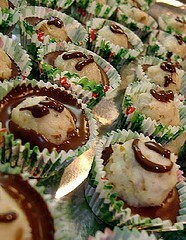 Potato candy is not only known as a homemade Christmas candy, but also a traditional candy for St. Patrick's day, too. Peel the potato and boil it in a pot of water until done, but not overcooked. Place the potato in a bowl and mash it, adding the butter while mashing. Stir in all of the powdered sugar until well combined. You may need to use your hands for this part after it starts to get stiff, kneading well. Form balls or logs (whatever shapes you like) and dip into the cinnamon and roll to cover completely. As quickly as possible, wrap the candy is clear wrap and/or place in an airtight jar. 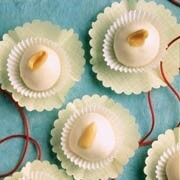 The potato candy hardens quickly so you want to work as fast as you can to keep it from getting hard, dry, and crumbly. I thought so. Let me know what you think of the finished result.